Published August 22, 2011 By Anna T. This post may contain affiliate links. Regardless, I only recommend sites I've researched and/or used and trust. What Users Do is a website based out of the U.K. that will pay people to test out websites. This basically involves visiting websites and allowing your movements/clicks to be recorded as you navigate the pages. You will also be encouraged to speak your thoughts aloud as you explore the site, which means you'll need a microphone. Why do companies pay for this service? Because they want to know how well their websites are loading, how easy they are to navigate, and whether or not any aspects of the site are unclear/confusing before they officially launch them to the public. Getting your opinion in the early stages means they can quickly identify and weed out potential problems. Related: Opinion Outpost is looking for online survey respondents – low cash out with same day pay. What Users Do is pretty much the same type of site as User Testing and UserLytics, although the latter two actually pay a little better. 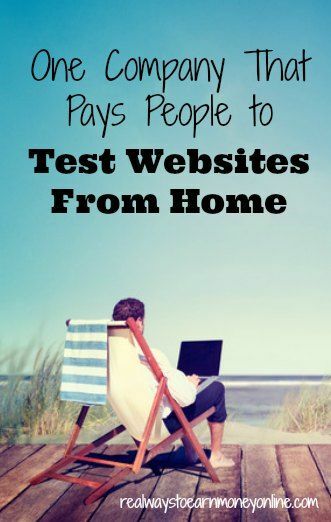 You cannot make a living doing user tests, but it is one of the best ways out there to make a substantial amount of extra cash online for very little time spent. Some people say that they feel a little awkward recording their voice initially, but over time you will get used to this and it won't seem like a big deal. If you enjoy getting paid for website usability tests or think you would enjoy it, I would suggest applying to as many sites like this as you can find to maximize your earning potential. Go here if you would like to apply now to be a website tester for What Users Do. Looking For More Ways to Earn Extra Cash Online? Check out this list of 12 other website usability testing companies that need workers. And if you are OK with taking surveys online, Opinion Outpost is one of the oldest and most reputable. They have a very low cash out threshold with same day pay. I like UserTest.io – they pay really well and quite easy going. I’ve signed up to WhatUsersDo but haven’t received an invite yet…is there something extra I have to do to complete my registration? Whatusersdo is a waste of time for me. I signed up for the site and did the instructions. They keep sending the rejection email twice to saying instructions wasn’t followed. I followed the instructions. I feel they were too high maintenance on email response. Good luck to people on use that site. This would be useful for me (extra coins) and my webmasters friends! Just two of those would be 15$ a day 450$ a month. Not bad! Is this a realistic sum to make? It’s hard to say, Marlene because from what I understand the work is kind of sporadic. You may have two or three test invitations one day and then none for a couple more days to a week. Then there might be days when you have five test invites! Being that I like Userlytics, I think that I may need to try this one. One question though, Can anyone join even though its a UK based business?